← Congratulations Week 04-06-15 & 04-13-15 Giveaway Winners! Cynthia Woolf isn’t in her office right now but Cora, Cynthia’s heroine in book three of The Brides of San Francisco series, graciously agreed to speak with us! Cora Jones, I don’t have a nickname. I was born in New York and lived there until I came to San Francisco as a mail order bride. Going ice skating with Asa and Virgil. I remember it because Asa helped me to skate. I kept falling but he kept helping me up. He stayed with me, his friend’s little sister, all day. I’m going to a nice dinner with Asa. I’m wearing a coppery satin dress of my own design. I go to my bedroom and I cry. I don’t know if I’ve been in love before. I cared deeply for Asa and mourned him greatly when I was notified he was killed at the battle of Appomattox Courthouse at the end of the War Between the States. I guess my biggest fear is that I won’t succeed with my dress shop. Asa is the only one I would tell this to. I can tell him anything. Well, since I’m already planning on making dinner for Asa and Harry, I’d make you what I’m making them. Roast beef with Yorkshire pudding, gravy, mashed potatoes, green beans and blueberry cobbler for dessert. I’m wearing my favorite yellow walking dress. It has long sleeves that are slim fitting up to the elbow and then puffy after that. Most women would wear it with a bustle, but I simply use three petticoats and I get the fullness in the skirt that I desire. The dress has a short jacket with a collar and lapel that goes with it. The jacket has wide sleeves that go to my elbow so the sleeves on the dress show. I don’t think there is anything in life that I can’t have. All things are possible if you’re willing to work for them. Thanks for talking with us today, Cora. Next time you see Cynthia Woolf, please thank her for arranging your visit with us! BE SURE TO COME BACK to read more about Cynthia, her release, and an excerpt from CORA on Wednesday’s Karen’s Killer Book Bench. Happy Reading! 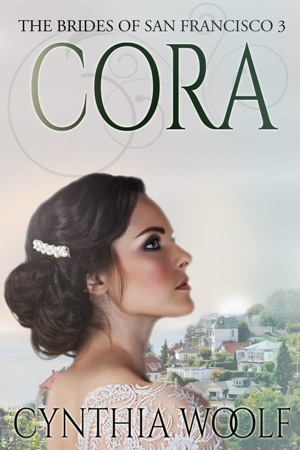 Thanks so much for having me…er…Cora on your blog this week. We’re very happy to be here. Character interviews are so fascinating. Thanks for sharing Cora with us, Cynthia. Good morning, Cynthia. It was a pleasure to meet Cora. I can’t wait to share more of her story with my readers on Wednesday. Thanks for sharing her with us! I have read several of Cynthia Woolf’s Books but not this one! I have read book 1 of this series and loved it! Can hardly wait to read more and highly recommend all of BOTH Cynthia Woolf and Karen Doctor’s Writing! You can’t go wrong with them! I like meeting the character this way! It’s fun! Thanks for including me in your recommendation, Jan. 🙂 Glad you enjoyed the character interview. Fabulous cover. I’m sorry that her friend died. Hopefully she will find someone else she can tell her secrets to.